Fonterra's historic loss, a change of leadership and a review of dairy industry law have opened up a strategic vacuum that could see its brands carved off and sold to reduce farm debt. Bernard Hickey looks at the pros and cons. New Zealand Inc would prefer the latter, but farmers are clearly having doubts, and a breakup is a live question after Fonterra's first annual loss and the announcement of a strategic review of its assets, with a fresh look at its capital structure. It was clear from last week's news conference that all options are on the table, including selling assets offshore and returning capital to farmers. Fonterra could end up as a collection of milk drying plants that export paper bags of milk powder, or it could continue down the track of spending heavily on more sophisticated production, processing, marketing and distribution here and overseas. The future of New Zealand's biggest company and export earner now hangs in the balance. The open question is how much of that $6.35 billion farmers want back, and just how committed Fonterra's new chairman and CEO are to the previous strategy under the previous leadership duo of CEO Theo Spierings and Chairman John Wilson of moving more milk volumes to higher value-add uses at higher velocity: the so-called 'V3' strategy. "Fundamentally, the strategy doesn't change," Rivers said. "It's about capturing as much value as possible for our farmers and shareholders and unit holders, and capturing as much value as possible for the milk that we produce. But part of the stock take is to look across our businesses and adapt to find the best possible way to do that," he said. "The strategy in a nutshell is delivery. Where we need to focus on is getting some of the baseline business performance right," Hurrell said. "But we can't lose sight of that long term. The world is changing fast. Consumers have different demand and different need -- but weighting more heavily on the business in the next 12 to 18 months," he said. Challenged again on whether Fonterra wanted to keep offshore value-add assets, Hurrell said: "That will form part of our review. We 're going to look at all these assets to see if they're producing the return on capital we expect -- do they have the growth plans, and if they don't, they'll be on the table." "In the first instance and in this order, they like land, cows and shares. They like the shares less when they don't get a good return on them. So they're all issues, and they go back to performance, cost controls and respect for capital," Monaghan said. "We've done a lot of listening. We're a broad church. There's a full range of options and over time those options will become clearer. We're part way through that work," he said. "It is only an economic model in the first instance, but it's a model that's very well suited for the business we're in, where we deal with a perishable product," he said. "Being a cooperative in the first instance was to stop us being price takers. And if you look over time there's been a large gap between what a New Zealand farmer has earned and our US and European counterparts, and the big reason for that is having Fonterra and the co-op and having some critical mass." Monaghan reiterated Fonterra's position on the ongoing Government review of the Dairy Industry Restructuring Act, which set up Fonterra in 2003 and forces it to accept milk supplies from all-comers and to sell milk to all its competitors. He said Fonterra wanted to end the policies of being forced to accept milk and to sell it to competitors. "We would like to see at the end open entry and exit. It had very good purpose when it was set up. When we were set up we were 96 percent of the market. Today we're 82 percent. There are 10 other companies, most of them funded from offshore, and they are competing and there's a competitive market there," he said. "The risk we run with the obligation for Fonterra to have to take all milk is that it slows down our journey into value-add, and it's not a good outcome. Forget Fonterra. 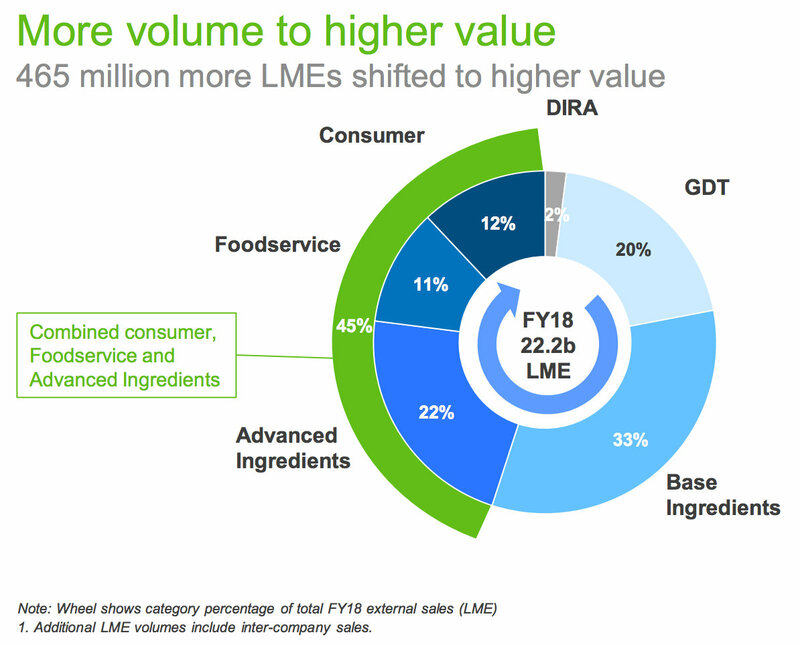 It's not a good outcome for New Zealand Inc."
This chart shows that 17 years after its creation, 55 percent of Fonterra's milk is still sold as commodities and just 45 percent is 'value-add', although that is up from 42 percent a year ago. "A better idea would be to dissolve this failed marriage and set Fonterra’s branded-products business free to operate in competitive tension with its milk cooperative," Fickling wrote. "On one side we have farmers who rightly want the maximum return for their milk so they can invest in their own farm infrastructure. On the other side we have Fonterra wanting to pay the least for its milk raw product so it can make a greater margin on its products and invest in more value-adding infrastructure so it can compete with the likes of Nestle and Danone in branded goods," he wrote. "It’s a classic business paradox with clear commercial conflicts. Because of this diametrically opposed dynamic Fonterra also finds itself capitally constrained. A 'buggers' muddle' some farmers might say." 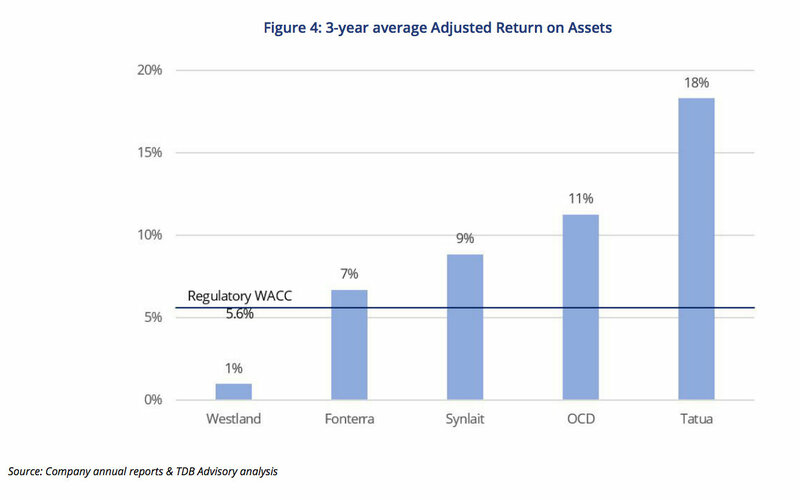 A major reason for farmers' reluctance to invest in assets they can't see offshore and to trust managers they employ in Auckland and elsewhere is the high and tax-free returns they have been getting from leveraged investments in land. As this chart from a TDB Advisory report on the dairy sector from April shows, farmers are now weighing up whether to leave their money in Fonterra, or just to keep investing in buying out the neighbour's property and converting sheep and beef land into dairy. Even those who prefer shares are now looking more closely at investing in other dairy company shares, such as A2 and Synlait. Last week's loss may have been the death knell for New Zealand's Inc great white hope of creating an internationally expansive and high value exporting company.